Prior to the movie, Uncle Tom’s Cabin was adopted into a musical titled, Topsy and Eva, one sister playing Eva and the other in black face playing Topsy. In these roles, the sisters grew to be performance royalty. 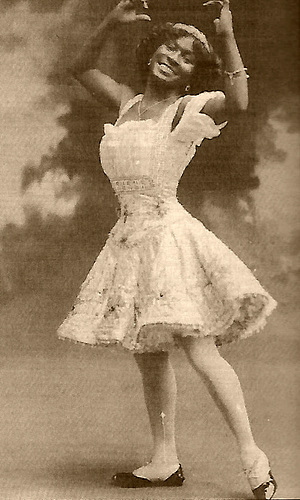 Topsy and Eva became a traveling, eventually appearing on Broadway. In the 1930s, new songs were added and the show was revived three times up until the 1940s. The sisters continued to play the roles into the 1950s, so the story’s popularity is undeniable. A silent film was made based off the stage play, however, it did not have the same commercial success. I am most interested in D.W. Griffith’s involvement with movie, as he worked as the final editor. Griffith is considered to be the Father of Film, however his racist and excitatory films such as Intolerance and The Birth of a Nation, are catalysts and permission givers for racist hate groups and some of the most violent crimes committed on American soil. 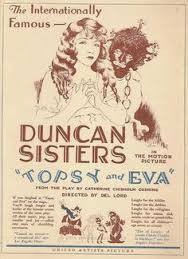 I wonder what is interest was in a show like Topsy and Eva. Was it a cinematic interest? An opportunity for further mockery of Uncle Tom’s Cabin’s message? Were the two characters of any interest to him? These seem to be important questions as, historically, Griffith had such a knack for inciting the spread of intensely divisive and fear ridden emotions. From those emotions rose sentiments that have since shaped the legal, social, infrastructural, and cultural institutions that have negatively impacted race relations in the United States. Today, media’s psychological influence can thank Griffith for his introduction of imagery. Images, especially those that move, reimagine scenarios and often it can be hard to separate those images from reality/truth. They are stuck, engrained, and determined to color every thought with their presence. Topsy is a fictional character, but her presentation in the novel and in works like the one above, influence the way the viewers regard children of color. Children of color, in turn, change the way they view themselves, wonder at what’s even possible for them, accept that maybe foolishness is acceptable, dream smaller, believe they are less, etc. The visual impact of this video is serious and detrimental to both the mocked and the spectator. However, the historical memory of such films and imagery has inspired art that counters Griffith’s spirit, art I hope to uphold in my reimagining of Topsy. Ethel Waters and Topsy: Say What?! 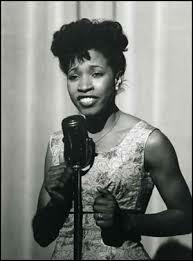 I spent some time researching artists that arose from Topsy’s influence on black entertainment. 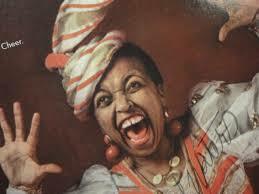 I was struck by the similarities between the upbringing of Ethel Waters and Topsy. In her autobiography, Ms. Waters talks about growing up, saying, “I never was a child. I never was coddled, or liked, or understood by my family. I never felt I belonged. I was always an outsider.” The same loneliness seemed to run like a thread through Topsy’s story, but there’s more! 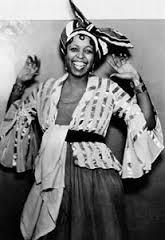 Ethel Waters did not have a relationship with either parents, and lived with her alcoholic aunts. From them, she learned to tell a story through song. Later, living with her sisters, she witnessed quite a few heavy moments, all of which required her to grow up quickly. 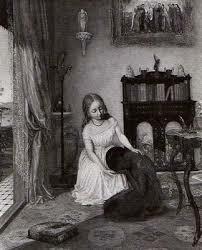 Ethel, having endured much trauma, was able to keep her head on straight working as a chambermaid. There isn’t an exact alignment in stories here, but keep reading. What I’m trying to get at is quite obvious but shouldn’t go without being said. The power of visual representations has been evident in every facet of my research. Makes sense, I guess. Sight allows us to visually connect with everything around us. It is the key to the worlds we inhabit, real and imagined. Therefore, what we see dictates how we feel, what we believe, creates memories, impression….Jayna Brown describes this sort of moment by saying of Topsy, “Topsy casts off the domestic harness and transforms herself in the space of labor, reclaims her body in the place of work.” In the same the way, Ethel Waters is reclaiming her body by creating a character for herself in a place were she labors with no face, with little sense of self. This reminds me of a previously posted picture of Kara Walker’s reimagining of Topsy holding a watermelon, looking like an angel. I want this doll that I be representative of what Topsy would have seen in her “Ethel Waters mirror moment”- someone beautiful, confident, and free. It’s funny to think that in the mirror, even when you are playing, what you see is yourself. Even if it’s a different self, it is still the self. No one ever told Topsy that. It’s crazy because I feel like she is right in my hands when I flip Stowe’s pages. If only I could whisper, ” Topsy, everything you want to be, you already are…” We live in different reality but I digress. Topsy’s doll will be a realization of the self she was never allowed to be unless she was pretending. That’s also a funny thought because throughout much of the book she is doing just that, pretending. Ethel Waters went through the same emotions, but she had her moment to shine. This doll is my attempt to create Topsy’s diva persona. Maybe then she’ll have a shot at a career like Ethel’s . Her debut will be as a lovable little doll that’s hugged and tucked in at night. In her mansion, she’ll have drawers full of clothes, a piano to write songs, and other little chocolate girls that comment on how nice her hair looks. I hate that this was not her reality- that in the world of the novel she has none of this From people like Ethel Waters, folks who lived a life just like Topsy, we do find triumph. That gives me some hope. Ethel Water is to Topsy as Diva is to Doll. Topsy is introduced as a performer, so in my reimagining of her, I thought it necessary that I include sound. Just as people of the time were interested in providing all sorts of supplementary material to create Topsy beyond the page, I wanted to explore what a more critical approach to her performance might look like. In quiet moments, what would Topsy hum to herself? Perhaps she had a tune that she picked up from before St. Clare, a tune that reminded her of a more carefree time. It is part of the slave tradition to sing while working. In fact, Irish songs from their enslaved period have similar melodic make-up to black slave songs in the United States. People sing to cope and express deep pain. What would a Topsy spiritual sound like? What would she sing while she worked. The next song is just a reconfiguring of the popular minstrel song, Dixieland, Topsy style. She might have been told to sing it for guests or St. Clare one way, but maybe one day, she was feeling especially lonely or stubborn, so she sand the song a different way. The last piece, is intended to be a refurbishing of an old Topsy minstrel song written by George Howard, Oh, I’se SoWicked. I have posted the lyrics below, and you’ll notice some of them are woven into the new song I’ve written. The lyrics are absolutely deplorable, you guys. Ching a ring a ring a ricked. Oh! cause I was so wicked. Ching a ring a bang goes de breakdown. Ching a ring, a ring a ricked. Oh! I’se so awful wicked. Ching a ring a hop, goes de breakdown. Oh! ain’t I very wicked? If I had my way (and the time), there would be a whole Topsy album. But What of Her Body? Topsy has had quite the afterlife. Beyond the page, she was consumed on a mass scale by white audiences, performed by both white (in blackface) and black artists such as Ida Forsyne, and is credited with inspiring black artistry especially that associated with body movements. 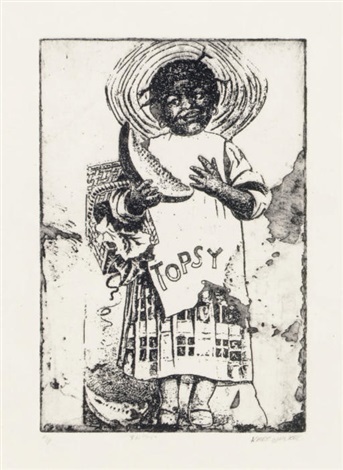 It is during this bathing that we are introduced to Topsy’s body as an object of historic and consistent abuse. Permanent marks are left from years of beatings, scarred skin, a darkened surface…. Topsy is a child- to be so young with so much trauma. That’s not a trope. It is true of so many childhoods of the time, and quite honestly, still remains true of children around the world today. Anyway, what are we take make of this little girl’s body? It isn’t smooth and white as one might imagine Eva’s body, but disfigured and marked up like property. I would like to explore whether or not that has anything to do with her being regarded as heathen. If her body was unscarred, her hair of a different texture, her presentation a little cleaner, would she be worthy of less pity and more relatability? Even more than her physical appearance, I wanted to consider her performance via her body. There is a long history of blacks using their bodies as a way to redefine their freedom- to escape and defy. Does Stowe’s presentation of Topsy fit this framework? What of Topsy’s body? Is she free? Her every movement, joke, theft, song, and facial expression makes manifest her authority over herself. Individual gestures of any nature can neither be bought nor sold. I have been supremely impacted by this little Topsy girl. It made me think of all the ways in which I perform. Does the world see me as a foolish Topsy? Am I somehow a disgrace to the black image in the foods that I eat, my word choice or dialect, way I wear my hair, things I find funny. During the time, blacks were always dealing with a desire to protect and grow a more positive/empowered image. There was a rift between those attempting to shed controversial skins, skins related to “Uncle Tomism”, Topsy, Sambo, Mammies, etc. and those maximizing off the economic gains of playing into such tropes. 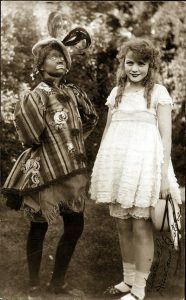 White people of the time, and even today, loved this foolery. To the uncritical eye, Topsy, breathed life into such stereotypes BUT more importantly, she took claim of a life that was denied to her. She made her own fun, her own games, her own joy. And what of her body? It went beyond the vocabulary of Stowe, reconfigured expectations, and became a slate on which many can mark their experiences. Despite popular belief, there is no such thing as one dimensionality in regards to her character. She is all of the latter. As time moves forward, I do not doubt that she will come to be even more. An angelic Topsy reclaiming her space with some watermelon and the cutest little grin vs. unloved Topsy being comforted by angelic Eva whose touch is supposed to save the day. I prefer watermelon angel Topsy.